Tom Tamarkin, dba USCL Corp, launched concepts and developed technology that would revolutionize the way electric utility companies delivered their products, billed their customers and ultimately receive payment for their product and services. In 2003 the concept of the communicating smart meter was presented to Southern California Edison and utilities across the country. Data communications took 2 forms. The wide area network connecting each and every utility power meter to the utility’s back office billing system and the data communications between the smart meter and consumer electronic devices including smart phones. The Internet of Things was presupposed long before IoT became a hot buzz phrase and the standards for all new power meters in America was developed in detailed specification format and provided to the utility industry via the Southern California Edison RFI and RFP process. A ZigBee compliant based LAN transceiver was embedded in the meter. ZigBee was proposed by Tamarkin, et al, in early 2005 in the OpenAMI form organized by Southern California Edison and participated in by 100+ utilities worldwide. Tamarkin & USCL filed for what became 3 U.S. patents. Additional foreign patents were granted in Israel, the EU, and China. The parent patent, 7,379,791 was granted in May 2008 and provides broad system topology coverage when a power meter is used in conjunction with the utility’s billing system and customer accessible data which can be used by the consumer to control electricity usage. A second patent, 8,306,668 was granted as a continuation of the parent in November 2012. This is very strategic. Its most valuable claim covers a remote service connection-disconnection function inside the meter used by the utility company to turn on and turn off electrical service when a customer moves in and out of a home or as a collection means in the event of payment tardiness or non-payment. This concept was included in State of CA Public Utility testimony for minimum meter functionality and in the SCE specification. Today virtually all new smart meters contain this feature. A third patent, 8,639,390, was granted as a further continuation of the parent in January 2014. A robust set of functionality and functional apparatus claims in the 8,639,390 cover the utility billing, as well as the WAN to LAN interface and the use of electricity consumption data. Specifics include smart phones, smart thermostats, smart appliances, sensors, electric vehicle charging stations & dashboards and “subscriber side billing” or the pay as you go concept with electronic funds transfer. 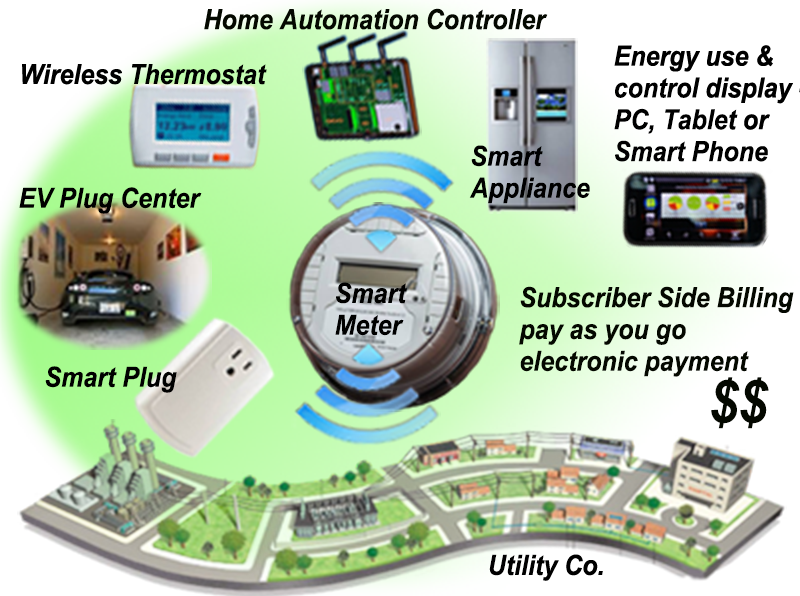 Today there is an installed base of over 65 million such smart meters in the U.S.; this will grow to 100+ million by 2020-22. Another component of EnergyCite’s IP strategy is to continue to file for new patents based on the existing patents which will survive the term of the existing patents and create a wider baser of users. Hence utility companies and hardware/system firms must be licensed by us in order to practice the patents to avoid contributory infringement. EnergyCite dba USCL spent many years developing the market for the products covered by its patents. CBS News Coverage shows our working devices in 2007. However smart meter deployments did not begin in mass for many years later. Thus the firm’s ability to generate revenues and returns on its invested capital was delayed accordingly. As a direct result of EnergyCite dba USCL’s work and investment newly deployed smart meters all contain radio devices which EnergyCite dba USCL forced the industry to incorporate as a baseline standard. A March 2017 U.S. Supreme Court ruling reverses the applicability of the doctrine of laches which makes an infringer’s affirmative defense of infringement much harder. In short, “laches” is an equitable defense that an alleged infringer can raise when the patent (or copyright owner) has waited too long (from the defendant’s perspective) to bring a lawsuit. This is rooted on the premise that it would be unfair to sit on the sidelines watching an infringer invest significant resources to build a successful business over time, only to come back years later and ask for a slice of it. Laches were usually triggered after 6 years of inaction (assuming the patent owner knew all along about the infringing acts) and it also meant that you could no longer claim past damages against an infringer, only future damages (which cannot be quantified). This defense is now gone.